Above: A view of inside the artwork. 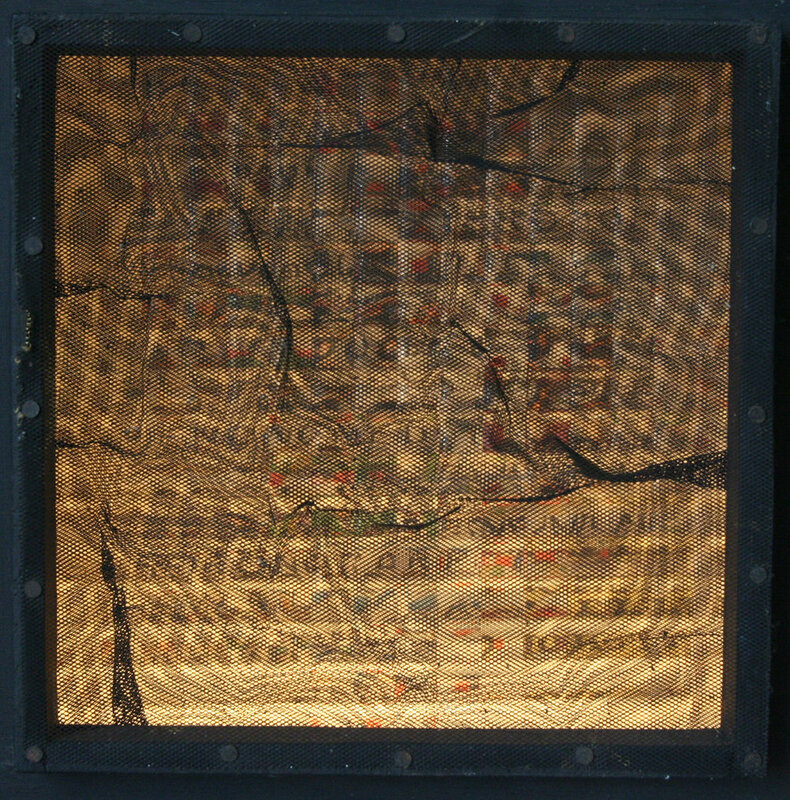 This collaged text is viewed through the dark metal mesh of the box. Painted wood, wire mesh metal (shaped for moiré effect), plastic, letraset, light bulb, electrical fitting. 420 x 420 x 120mm. Made in London. Exhibited in the First International Exhibition of Concrete & Kinetic Poetry at St. Catharine’s College, Cambridge, 1964. Provenance: Stephen Bann. Cruxent is seen as a leading figure of the Venezuelan avant-garde, as well as a noted archaeologist, with a foundation dedicated to him in Caracas. Bann was introduced to the artist by Frank Popper in 1964 and wrote an article on his work in the English magazine IMAGE in the same year. The Métromane light box work combines Cruxent’s use of dark metal mesh creating a moiré effect with back-lit squared plastic elements and letters. The kinetic movement is created as the spectator moves in front of the work and observes it. The work was made specifically to be exhibited in Cambridge. As Bann concludes in his IMAGE essay, the artist’s ‘use of an optical effect in order to refine and concentrate the reactions of the spectator will prevent even more grandiose works from becoming oppressive or merely decorative’. (P. Steadman (ed. ), Image – Kinetic Art: Concrete Poetry, 1964, p. 37). Previous to the landmark exhibition at St Catharine’s College, Cruxent’s one man shows included 1962 and 1963 Museum of Fine Arts Caracas; 1963 Palais des Beaux-Arts, Brussels; 1964 Club des Poetes, Paris and Museum of Modern Art Haifa, Israel. It is extremely rare to find a work associated with the first ever Kinetic Art and Concrete Poetry exhibition in the United Kingdom, and early kinetic work by Cruxent is rarely available.